Although I live in the city, you can’t take the island girl out of me. I think everyone that lives here is, essentially, an island person. We are, after all, living in an archipelago with over 7,000 islands. And, technically, I am on an island myself…just a very large one, and living nowhere near the shore of it, surrounded by buildings. But, hey, I am not going to quibble about these small details. We are island people, and I for one intend to reap the benefits…even from my little flat in the urban jungle. One of those benefits, and one of my favorites at that, is fresh seafood. Now, don’t think my table is laden with the bounty of the sea every day, not at all. But just having the opportunity to buy a whole fish, some prawns, or a couple of crabs, almost any time I want, is a boon I am always and forever grateful for…especially since my husband and I love seafood so much. Clams and mussels are a bit tricky now with the rains, but still relatively easy to procure from a wet market. Steamed fish is one of our best-loved preparations whenever I get my hands on a lovely specimen of lapu-lapu (grouper or garoupa). Just stuffed to the gills (literally) and fairly buried with Asian herbs and aromatics, then drizzled with a mix of Chinese cooking wine (Shaoxing), soy sauce, and sesame oil, and then a brief steaming – this is absolute heaven for us. In fact, I’ve already posted a recipe before over here. So what is the difference with this steamed fish? Although the fish is cooked with some flavorings, the actual sauce is added after. The recipe for the sauce is from Bee Yinn Low’s Easy Chinese Recipes, a book of which I am such a big fan. I cannot say enough about this book and how it makes favorite Chinese restaurant classics suddenly seem so within reach in your own home kitchen. – Make your sauce: Mix all the ingredients for the Cantonese Style Steamed Fish Sauce in a small bowl and set aside. Heat a small saucepan over medium to low heat. Stir in the sauce and blend well. Once the sauce starts to bubble and boil, remove the saucepan from the heat and set aside to cool. – In the bottom of a large baking dish (preferably one with a cover) that will fit the whole fish, strew the leeks, placing more in the middle. Arrange a few of the lemon and ginger slices in the middle of the pan as well (leaving some to dress the actual fish). This is where the fish will rest upon. – Place the fish atop the leeks, ginger, and lemon. Stuff the cavity of the fish with the remaining lemon. Divide the remaining ginger between stuffing the cavity and laying on top of the fish. I also like to take some of the cilantro sprigs (which we will use after the fish is cooked) and stuff those into the cavity as well. 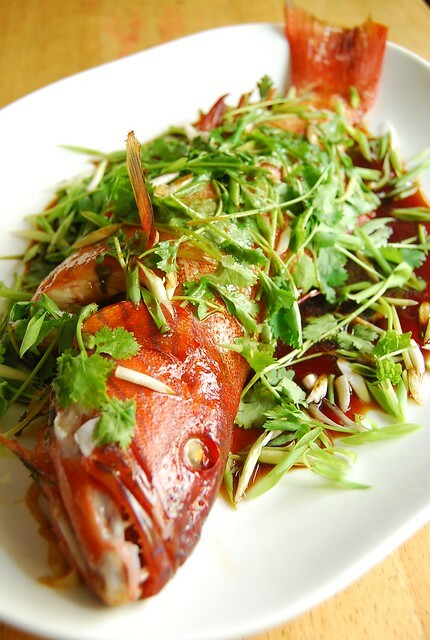 Drizzle the fish with the Shaoxing wine, soy sauce, and the sesame oil. Now look at the bottom of your pan. We need to have enough liquid to coat the bottom of the pan/dish with an even layer, not a lot though. Ideally you will have your fish raised up on the veg/aromatics and the bottom of the pan covered in a slick of just about 2 mm of liquid. – Cover the baking dish and cook in a pre-heated 375F over for about 25 minutes (could be more or less) or until done (when the flesh flakes easy when pierced with a small knife). – When the fish is done, lift it out of the baking dish and onto a serving platter. Remove the ginger from the top of the fish. Pile the green onions and cilantro on top of the fish. Pour the Cantonese Style Steamed Fish Sauce over the whole lot and serve! Bee’s original recipe calls for fish fillets, although she herself says that she loves steamed whole fish but that it is not easy to find even though she lives close to many Asian markets. Another reason to count my blessings that I can find fresh whole fish fairly easily. I have adjusted her recipe to take into account my whole fish. So know that you can make this using fillets as well if you need to (she uses 750 grams fillet of red snapper, cod, or sea bass). The recipe above is further adjusted for steaming a fish in the oven – and I’m not actually sure you can even refer to it as steaming, although I do. See, I don’t have a steamer big enough to fit a 1-kilo fish, and I’m thinking perhaps some of you may be in the same predicament. This is the simple solution I turn to – the fish is cooked in the oven in a kind of “steamy bath”. The key is to lay the fish on some aromatics to lift it off the surface of the pan, just a bit, you don’t have to set it atop a mountain, and then just make sure that there is enough liquid at the bottom of the pan to steam it. You actually don’t need much. I usually just make sure the bottom of the pan is covered in a thin layer of liquid. Also, goes without saying, you need a cover to “trap” the steam. You can use some tinfoil, tightly sealed, if your roasting pan doesn’t come with a cover. I use this deep roasting tin with a high cover (we have actually cooked a turkey in there before) that I won for “best costume” at a Halloween party years ago (before the kids came around and my ability to dress as “naughty teacher” was not yet seriously compromised). If you are lucky enough to have a big steamer then just do as above but on a deep plate in your steamer, then cook as you would on the stovetop. We thoroughly enjoyed this version! The fish was incredibly soft and succulent, and we made sure to remove the bones for the less experienced fish eaters at the table (little C and little H, who loved it as well). I like to make sure that my children grow up seeing and eating fish on the bone, as I did. Adding the sauce after the cooking gives the whole dish a cleaner look and sharper taste. And the flavor of Bee’s sauce really hits the spot – like our favorite steamed fish dishes at the Chinese restaurants. This recipe is a keeper and you can be sure I will be trotting this sauce out again and again (Bee uses it with oysters too!). This was all that was left after C and I, and our two little ones, were done with it. Yum! In as much as I would like to get my kids to eat fish cooked whole, whole fresh fish is not easy to find here. The Asian markets usually have them, but they're not as fresh as you'd like. But I will make this soon! Joey!!!! OMG it's been toooooo long. So glad that you are using my cookbook. xoxo hope all is well. This look so fresh and scrumptious. I would like try this definitely. This is what's referred to as "Last Friday Dinner" (as in the last Friday of the month) at our house: a whole fish in tangy sweet-sour sauce. Yum! I would definitely try this one for my famly. Btw, you mentioned before that little C is hesitant on eating chocolates (because of it's color), how is she now? Hi Mieke! I know whole fish is not as easy to find elsewhere so I am always grateful for it and try to never take it for granted 🙂 Hope you can get your hands on some soon! Hi Bee!! I know! I am loving it, truly! Thanks to you Chinese cooking seems so much more approachable! What an awesome fish dish. I've missed lapu lapu from the Philippines cooked this way. I have to go to Chinatown (2 hrs drive from us) to find this kind of fish. Thanks for the recipe. Brings back memories, Joey! Hi Betty Ann! Come and visit us then! 🙂 🙂 We miss you!